I used to be a self-described adherent of the Quantified Self movement. Like many movements it does not have a strict definition nor formal membership requirements, so everybody brings their own definitions, goals and needs to it. It’s pretty obvious, given the name of my blog, that I’m moving into a different direction, but that’s not to say that I think Quantified Self is fundamentally misconceived. I do however think there are costs and risks to certain Quantified Self approaches that are not immediately apparent, and as more people start tracking behaviors, buy trackers, and buy into the general hype the more those risks will become apparent. Like I said, there isn’t one definition of Quantified Self. Instead, there a different strands to the movement, serving different purposes, and pull the movement into different directions. These are tracking projects to help answer specific questions, usually over the course of a few weeks. For example, “will this supplement make me more alert?”, “does coffee cause my headaches?”, “will sleeping in a colder room help me sleep longer?”. Ideally, these experiments are simple, testing one variable at a time, with a duration that’s long enough to let you see patterns, but no longer than they need to be. This kind of self-quantification can yield actionable results but does not commit the experimenter to a lifetime of tracking drudgery. This is an enlightening, low-risk activity, as far as I can see. Typical examples of this approach are setting a weight and/or health goal and using tracking to keep yourself honest. Followers will, for example, track their intake (calories) and their output (exercise, steps), and will usually set smaller daily goals in pursuit of the bigger goal. Other measures that often get tracked alongside include body fat, macros, blood sugar and so on. This kind of tracking has been around for a very long time, and popular diet programs like Weight Watchers are built on it. While this tends to work well for many people the challenge is to keep going when you’ve reached your goal. You can treat it as short-term intervention and cease tracking when you achieve whatever you wanted to achieve. The fact is that the vast majority of people find it hard to stay at goal. For example, well over 90% of people who have lost weight on a diet gradually backslide and end up where they started or heavier. The alternative is to keep tracking to keep yourself at goal, potentially for the rest of your life. The cost of perpetual tracking is high – in terms of time consumed (tracking calories in particular is a pain), non-intuitive relationship with food, obsessive exercising after overeating and so on. It can be a life-long commitment. Few people are fully aware what they’re taking on when they embark on a project like this. These kinds of one-person “studies” are often gadget-driven, and basically involve generating a multitude of data sets over a relatively long period of time with the idea of discovering interesting patterns and unexpected correlations. The promise is that if you track ten different variables from sleep, to mood, to exercise, to food, to emails, to keystroke quantity, finance, to weight, to day parts, to energy levels, to you-name-it, that the data will give up interesting, surprising insights about you, that will allow you to tweak your behavior, fix problems and optimize your life. In terms of commitment these kinds of projects ask a lot – a lot of time and dedication. While gadgets can log some of the data for you, there is still a lot of data that you have to put in yourself, such as mood, sleep quality, food intake and so on. A certain amount of obsessiveness certainly helps. There are many people now how have embarked on these kinds of open-ended projects. The continuing proliferation of gadgets will only fuel this particular kind of quest. And yet, of all the different ways of quantifying the self, these are by far the most problematic. In the vast majority of cases they yield only trivial insights: that sleep quality impacts mental acuity, that exercise can boost mood. In other words, they generate the kinds of insights you could have pretty much figured out by observing yourself for a couple of days without the use of any kind of complex gadgetry. The quest for insight ‘gold’ continues and there are now more apps and services that promise that they’ll sift your data output and find that elusive non-trivial insight, yet the results so far have been less than impressive. That’s because there’s a fundamental flaw in the thinking. One of the basic principles behind scientific inquiry is that it needs to always be driven by hypothesis. Science is propelled forward by testable theories, around which experiments get designed, which will either confirm a theory or refute it. Science does not happen by watching streams of data unspool, with the hope that an interesting finding will emerge by itself. And yet it is the two less interesting and less productive streams within Quantified Self that seem to be on the ascendance. This is no doubt driven by gadget manufacturers and tracking app creators who have the most to gain by a population of obsessive, only vaguely purposeful self-trackers. Quantified Self would be well advised to be careful about its new best friends. They might inject excitement and noise in the short term, but dilute the experimental spirit of the movement in the long term. I am, for reasons too obscure and irrelevant to explain right now, an expert in kitty litter. Having spent a lot of time having to think about it made me appreciate its profound role in people’s lives. Humans have adopted cats in order to fulfill a profound need, to love and to take care of others. This love and care is manifested in many ways, including cat food. All this love and care and affection conveyed by cat food finally ends up and gets absorbed by kitty litter. A $7bn industry that gets absorbed by a $2bn industry. 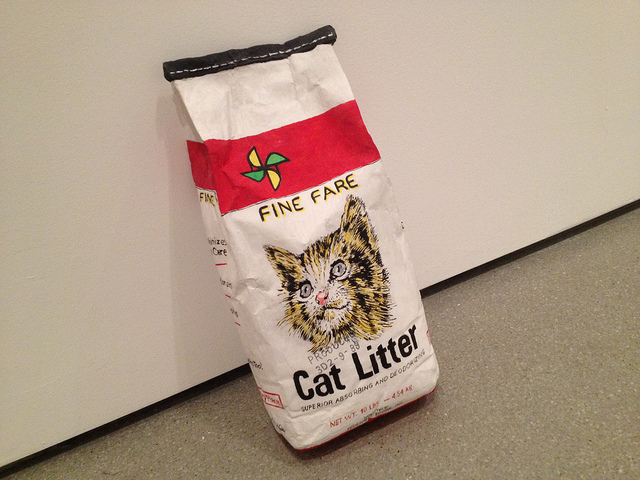 While love, and care and affection are profound, what gets left in the litterbox isn’t. Humans create a lot of data “exhaust”, but not at all of it is interesting and meaningful, and analyzing the aftereffects does not tell you much about the complex human causes. Think hard before you track. Obsessive tracking cost me a lot of time, made me obsessive, less adventurous and more harsh on myself, undermined my intuitive relationship with eating, walking and exercise. The “insights” it yielded were trivial and few in number. If you are going to track, focus on testing interesting hypotheses using simple experiments lasting a relatively short time. If you must track calories and steps do it for a short time, until you’ve got a good basic idea, and then switch to using your intuition. It’s one of your most precious tools. Don’t mess it up. As for the Quantified Self movement, it’s been oversold as the cure to all of society’s ills. It is anything but. It doesn’t have much to say about the messes and moral complexities of human emotions and interactions of our everyday lives. Tracking is hard and time-consuming, and the majority of people don’t have the time or discipline to do it. And just because you give someone a tracker doesn’t mean they’ll change their behaviors in the long term. Because that’s hard. Most people will end up tracking for only months, perhaps a few years, which is as it should be. If you can’t live without self-tracking and quantifying yourself ask yourself where in your life you fear losing control, and face those fears.